After I made my way through the excellent Kurt Busiek series, I was really looking forward to reviewing this series because I heard so many good things about it. If you haven’t read my review of that series, check it out here. I’ve heard so many good things about this series, but I’ve also heard some folks say they didn’t like it because it didn’t feel like Conan to them. Admittedly, the tone of this volume is quite different from the last. Busiek’s series followed a young, brash Conan who was fresh from his home in the Cimmerian hills. It was a swashbuckling action-adventure that was full of savagery. In contrast, this has elements of that, but it’s very much a love story at its core. Some feel that’s an element that should be in a Conan story because it’s too sappy. But I feel it humanizes the character. Everyone has at least one true love of their life. And once you’ve crossed paths with that true love, whether it lasts forever or is a brief moment in time, you’re changed forever. 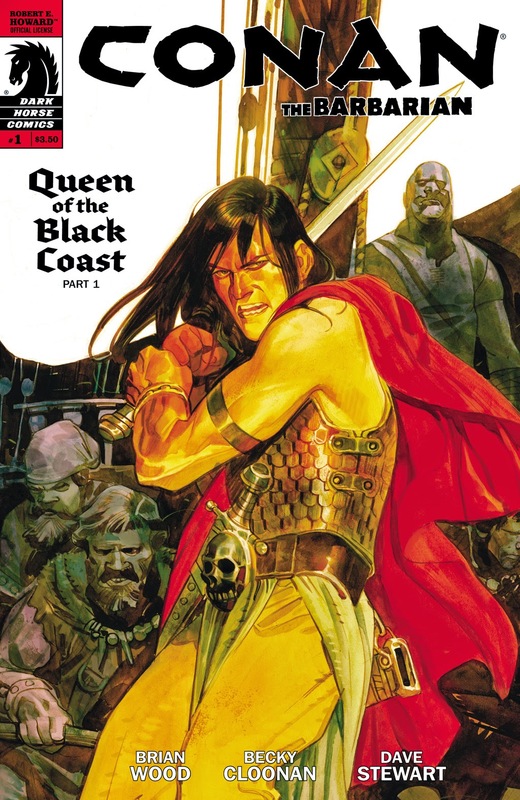 This 25 issue tale is based on a short story called Queen of the Black Coast by Conan creator, Robert E. Howard and published in 1934. It takes place shortly after the events of Busiek’s run. So we still have a young, brash Conan who has that arrogance of youth and complete disregard of his own mortality. Our tale begins with Conan, always looking for coin for women and ale, being hired to protect a boat from pirates in the area. On the open waters, they do meet pirates. And Conan, true to his word, fights with everything in his being to protect those on his boat. But it’s all in vain, these pirates are savage and slaughter everyone, except Conan. He’s the last man standing among this ill-fated crew, thanks to his fighting skill and brutality. This same prowess and ferocity doesn’t go unnoticed, the leader of this band of pirates is a woman! This woman is Bêlit, a Shemite who is queen to these pirates. She has a reputation of being unparalleled in her ruthlessness in battle and everyone who knows her, including herself, know that she has no equal--until she meets Conan. She knows immediately that she’s found a kindred spirit and the only man worthy of sharing her bed. What ensues is an odyssey that spans the course of a couple of years. There are many trials and tribulations for the young lovers and comrades-in-arms. Many times, their love is tested and, as the reader, you find yourself wondering “is this the breaking point?” Just fantastic storytelling, Wood really puts on a showcase for his talents here and has crafted a tale that, in my opinion stands toe-to-toe with Busiek’s previous volume--a feat I wouldn't have guessed possible before I read this. The art was by several different artist. They range from just okay and quite acceptable to the story being told to being absolutely stellar. None of the artists were terrible at all, but one of the shining points of the last volume was the consistency in artist. It’s a minor issue, but it’s there. The verdict: Totally recommended. The tone is different than Busiek’s run, but shouldn’t be discounted because of it. The love story is told very well and it worth experiencing for yourself. Preacher has the finest love story ever told in comics, in my opinion, but this isn’t too many notches below it. You owe it to yourself not to miss out on this one. It does get a slightly lower score than Busiek’s volume, only because I feel there were too many changes in artists.